[Infographics] – This is your Fourerr! What began as a small Micro Job Website 2.5 years ago, has evolved within a few years to one of the largest and most important Micro Job Websites today. We can only thank our sellers here on Fourerr who has been delivering quality services at a discounted price of 20% in comparison with Fiverr. 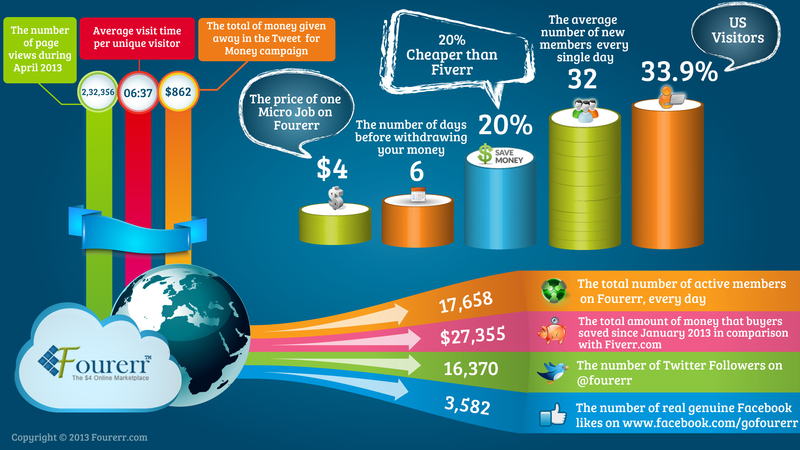 Here is to you … Fourerr in Numbers. 10 Comments on [Infographics] – This is your Fourerr! Reblogged this on Pure Truculence. Loved the info graphics!!! Thanks Fourerr!! Ryan – We must thanks – You rock! That’s great to hear … Keep us the great work Cuong! We love you too 😉 Have a great day!